Growing in popularity, India has been added to luxury travelers bucket lists all over the world. This beautiful country overloads the senses with vibrant colors, delicious cuisine and bustling streets. As you plan your trip to India, you might immediately gravitate to the beautiful white-sand coastline. However, you shouldn’t overlook a trip to North India! It’s full of unexpected adventures and luxurious surprises. When you think of a luxury safari vacation, Africa probably comes to mind. You might be surprised to find out that India is home to more than 70 national parks and 400 wildlife sanctuaries. Located on the outskirts of Ranthambore National Park is a luxury tiger safari camp. This was one of my absolute favorite experiences in India. When visiting this tiger haven, make sure you stay at Aman-i-Khas. An authentically luxurious, yet simple and modern design, made this experience one to remember! Rishikesh is known as the river rafting capital of India. With three levels of rapids, there is something for every type of risk-taker. Depart from the white sand beaches of River Ganga and take off on an adrenaline pumping experience. If river rafting isn’t your thing, instead try cliff jumping or trekking. There are an endless number of hikes in the North Indian region. If you are lucky, a friendly monkey (or 20) may even pop out and say hello! Appropriately translated to “The Temple of God”, over 100,000 worshippers visit the Harmandir Sahib daily to pray. This gold-plated temple will amaze you, as its reflection bounces off the surrounding waters. Everyday life in India is constantly interwoven with religion. After all, it is the birthplace of Hinduism, Buddhism, Jainism and Sikhism. A visit to North India is a tranquil and divine experience. If you don’t have time to visit this golden temple, there are still a number of peaceful and relaxing experiences to be had. Instead, practice yoga or go on a meditation retreat. Calling all tea lovers! India is one of the largest tea growers in the world. Luckily a visit to North India means uncovering plenty of tea plantations. In some areas you can even stay right on the tea estate itself! In the Northeast region, Assam, is often referred to as the “Tea Capital of the World”. Glenburn Tea Estate is another plantation in the Northeast. Here, you can witness some incredible views of the Kanchenjunga Mountain Range. The best part about this estate is that you can stay right on the property in a luxurious overnight bungalow. You’ll spend days tasting teas and sitting on the romantic terrace. For me, there’s nothing better than a cup of hot tea paired with breathtaking views of the Himalayas. In India, there are more than 50 astonishing waterfalls. Go ahead and venture away from the bustling cities and medieval towns. Instead, head to Bhagsu Falls. This famous waterfall in North India is located about a mile away from the suburb of McLeod Ganj. At the bottom of these falls, you can swim in the cool water that collects in a rocky pool. For a change of scenery, head further East. NohKaLikai Falls offers an incredibly dramatic backdrop. Hike to the overlook and watch these thin falls plummet down into the blue pool. If you are planning a trip to North India during Monsoon season, which is June through September, finding one of these falls is a must! You’ll be amazed by the power and beauty of this country’s natural landscape. Speckled blue, the houses surrounding the town of Jodhpur are definitely a sight to see. Glowing with vivid blue paint, the contrast against the dessert sand is breathtaking! These blue buildings are intermingled with medieval palaces, forts and architectural gems. Don’t forget to stop and take in the intricate details surrounding the arched doorways. These and the vibrant pops of color will have you constantly pulling out your camera. For the best Instagram-worthy shot of this colorful town head to Mehrangarh Fort. If you are looking to spend a few days here, book a stay at the luxurious Umaid Bhawan Palace. The private dining experience among their 26 lush acres of land is absolutely breathtaking. If you are looking for more destinations in Rajasthan check out 5 luxury hotels to stay in Rajasthan. Consider staying at the Oberoi Udaivilas in Udaipur it is truly one of the most beautiful and luxurious resorts in all of India. If you are staying in Rajasthan, you’ll definitely want to consider traveling to the Temple of Galtaji. This temple can be found in the heart of Jaipur. It’s a peaceful sanctuary where Hindu pilgrims gather to bathe in their seven sacred springs. Each spring is dedicated to various deities or spirits. However, the biggest attraction can be found at the Hanuman Temple. This temple is devoted to the Hindu Monkey God, Hanuman. 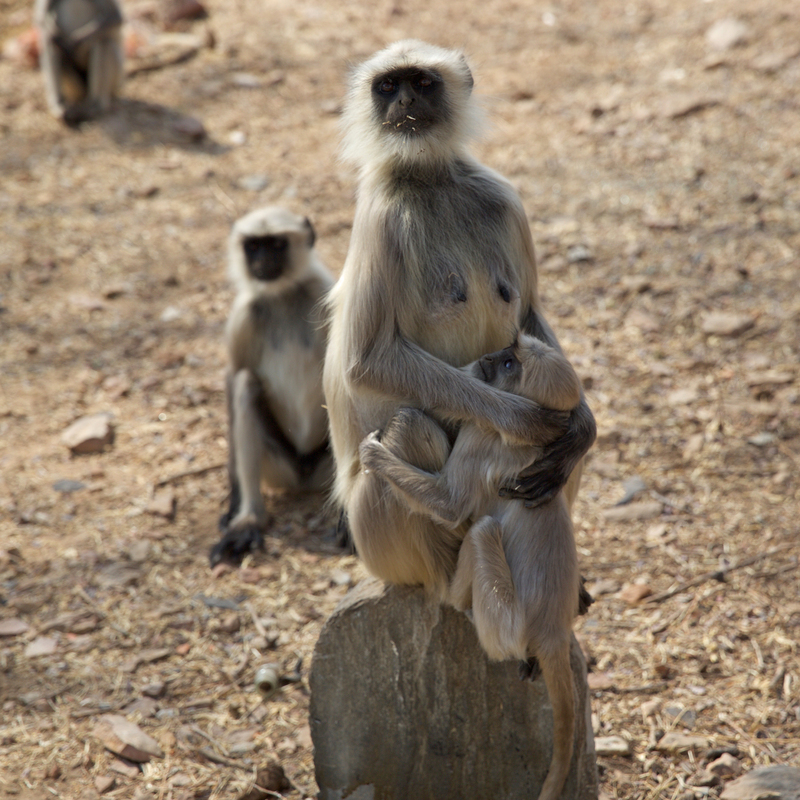 As tranquil and serene as these temples are, the mischievousness of these monkeys is what drives the foot traffic! While admiring the intricate temple facades you may notice a few monkeys hanging about. Be sure to enjoy the entertainment! 8. Monkeys and tigers are not the only animals you can find in India! Located in the Northeast corner of India, Majuli, is known as the world’s largest fresh water island. This lush green environment is far from the sandy coast, yet it’s one of the most beautiful water destinations in India. It’s also the world’s largest fresh water river island. Are you venturing to this stop on a trip to North India during the month of November? If so, you won’t want to miss the vibrant and colorful Raas Festival. Here, you’ll have days of entertainment as you watch masked dances and dramatic reenactments. It’s a cultural celebration that’s sure to make the bucket list! This list just merely scratches the surface of the unexpected surprises that await. It has so much beauty to uncover, and you’ll find a great element of surprise around every turn. This country continues to both amaze me and shock me! A trip to North India will always keep you guessing and wanting more. While uncovering the hidden gems during your trip to North India, don’t forget to add a stay at the Oberoi Amarvilas at the Taj Mahal! Misha Gillingham is the owner and operator of Wildluxe. Fascinated by luxury hotels and all of the details that go into creating that perfect guest experience, Misha focuses her creative efforts on showcasing only the most exclusive properties in the world. Follow along and discover the travel destinations you've been dreaming of.